In our devices when we delete something it doesn’t mean we actually deleted from the device. It may be possible recover lost data with simple software. What iMyFone gives to you is the possibility to delete data definitely from your apple device. It makes it possible to clean up the iPhone, ipad and ipod from unnecessary files to factory reset it or to delete unnecessary apps and to do all of this in just a few steps. How this system actually works? Everything you delete, in binary system changes from one to zero and of course, that zero now awaits to be overwritten with something else and to become one again. What this program does is it automatically overwrites that files with so-called (junk file) that the program generates and delete. Now, you are sure that your file is deleted for good. The program installation is indeed simple, you just download it from their site and it’s ready to be used. iMyFone Umate Pro is available for both macOS and Windows, is very easy to use. The first option let’s you to delete unnecessary files that iPhone collects in just one click and besides, maybe you manage to speed up your device a bit. The second option starts a factory reset, the procedure might be even simpler from the default one in the iOS system. The third option deletes the “deleted” files, which can be returned. The third option deletes the “deleted” files, which can be returned. It means that if you don’t want anyone to be able to see what you’ve deleted then this option is for you, as we said at the beginning. And the fourth and the last option deletes your personal, private data from your apple device, so no one can ever recover that data using other software. – Large Files: Find those large files and choose to delete selectively. – APP management: Display all the apps and sort by size, users can choose what to delete. 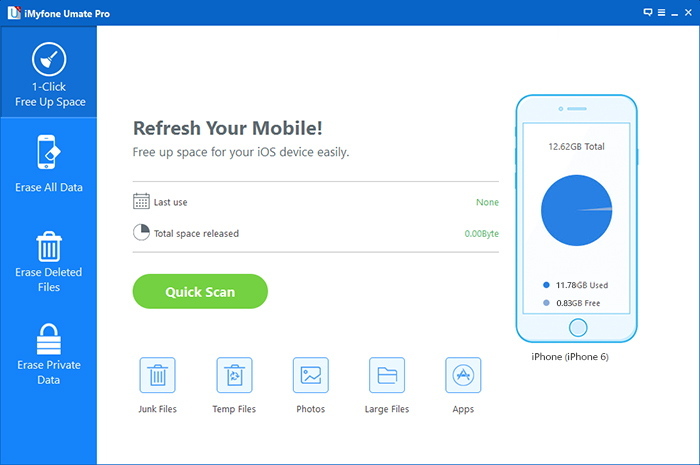 Free Up Space on iPhone in One Click, life saver for old people and tech noobs. Save Time!! – Friendly and intuitive interface, displaying important information and let use choose what to keep. – Completely remove all sensitive data before selling the iPhone or give to another person.